This post is the last post in our blog series called, “Our Speech-Generating Devices: Up Close and Personal.” Check out last week’s post here. 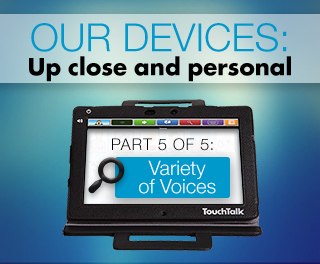 In the final part of our 5 part series, “Our Speech-Generating Devices: Up Close and Personal,” we’re talking about our new variety of voices offered on our MiniTalk and TouchTalk devices. If you’d like to learn more about this feature or our devices, please call our Clinical Consultant team at 888-274-2742. Our new devices are equipped with a total of 19 new voices! The new voices have various accents, genders, and nuances to help mimic the voice of the user. We added the wider selection of voices to make our devices even more customizable. To view the voice options and change your device's current voice, go to: The Menu Button > Settings > Choose Voice > then select your pick from the dropdown menu. Be sure to watch the videos below to hear three of the new voices. If you would like to see these upgrades ‘up close and personal,’ please call our team at 888-274-2742 and inquire about trying a TouchTalk or MiniTalk device for free.